This valuable antique syrup dispenser is bright green. Painted onto the base of the dispenser is green grass and a trio of daisies. 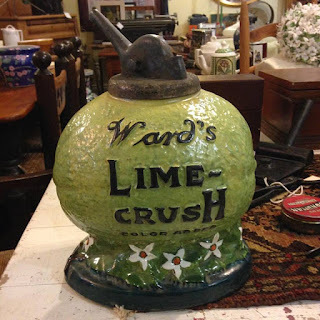 The dispenser itself is decorated, shaped, and painted to look like a lime. “Ward’s Lime Crush” is printed in black letters on the side of the dispenser.Call for price.